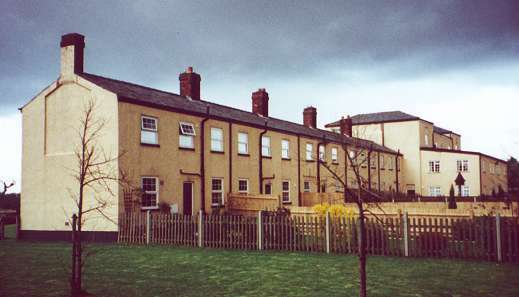 A pair of cottages on Manor Road in Dersingham once served as a local workhouse. In about 1783, the parish of South Creake set up a workhouse under Gilbert's Act. County of Norfolk: Anmer, Bagthorpe, Barmer, Barwick, Bircham Newton, Bircham Tofts, Brancaster (2), Broomsthorpe, Burnham Deepdale, Burnham Norton, Burnham Overy (2), Burnham Thorpe, Burnham Ulph and Sutton, Burnham Westgate (3), North Creake (2), South Creake (2), Dersingham (2), Docking (3), East Rudham (3), Fring, Great Bircham, Heacham (2), Holme-next-the-Sea, Houghton, Hunstanton, Ingoldisthorpe, Great Ringstead (2), Sedgeford (2), Shernborne, Snettisham (3), Stanhoe, Syderstone, Thornham (2), Titchwell, Waterden, West Rudham. Later Additions: Choseley, New Hunstanton. The population falling within the Union at the 1831 census had been 15,376 with parishes ranging in size from Broomsthorpe (population 13) to Docking itself (1,406). The average annual poor-rate expenditure for the period 1832-35 had been £16,840 or £1.1s.5d. per head. The new workhouse was built in 1835-6 on the Heacham Road to the west of Docking. The Poor Law Commissioners authorised an expenditure of £9,125 on construction of the building which was to accommodate 450 inmates. It was designed by John Brown, the Norfolk county surveyor. Brown designed several other Norfolk workhouses at Blofield, Henstead and Yarmouth, as well as ones in Suffolk (Plomesgate, Stow), and Essex (Colchester). Like Blofield and Henstead, Docking was based on a double-cruciform plan. Its location layout can be seen on the 1904 map below. Docking general view from the north, 2000. 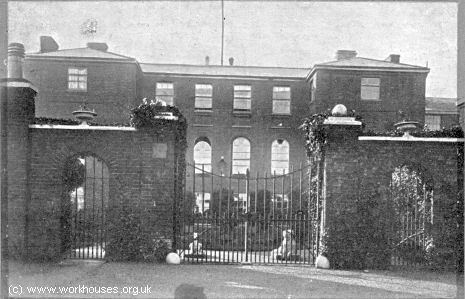 Docking workhouse entrance from the north, c.1905. Docking entrance from the north, 2000. 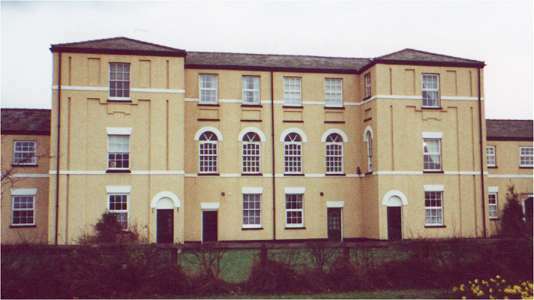 Docking main block western section from the north, 2000. Docking from the south-west, 2000. In 1916, the premises were taken over by the military to house airmen from the nearby RAF Sedgeford. When the building was returned to the Guardians in 1918, discussions as to its future use included converting it to an isolation hospital or into flats to help with the severe housing shortage of the time. In 1920, the site was sold to Docking Rural District Council who converted the property into a row of twelve council homes, known as 'Burnstalks', with removal of the building's north and south ranges. The building is now known as 'Norfolk Heights', with the homes now privately owned. 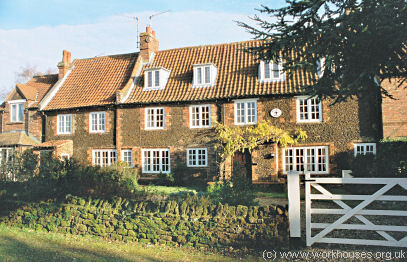 From around 1915, the Docking Union operated a children's home at Lyde Cottage, Fakenham Road, Docking. In 1924, it could accommodate 14 children who were in the care of the superintendent Miss M.K. Batley. The property is now a private residence. Norfolk Record Office, The Archive Centre, Martineau Lane, Norwich NR1 2DQ. Holdings include: Guardians' minute books (1836-1922, 1925-30); Ledgers (1836-1930, with gaps); Workhouse admissions and discharges (1902-5, 1907-9, 1916-30); Children's Homes admissions and discharges (1915-37); Births (1837-1930); Deaths (1837-1914); etc. Adams, David The Revolt and Taming of the 'Ignorant' (2014, Larks Press) — Looks at the 1835 anti-Poor Law riot in Great Bircham, using some of the Docking Union Guardians' Minutes 1834-51.